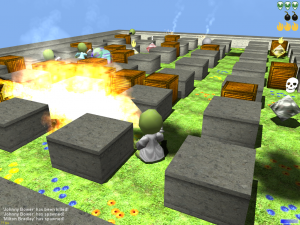 Multiplayer bombing fun – a free LAN game inspired by Bomberman! (2011-03-01) – Robombs 1.02 has been released. It includes the latest versions of the 3D engine jPCT and the OpenGL binding LWJGL. In addition, it offers enhanced graphics with higher detail for bombs and particles, shader support and a sky box. You can enable these features in the options dialog at start up. They are disabled by default, so when not changing them you’ll start up Robombs in good old fashioned mode. 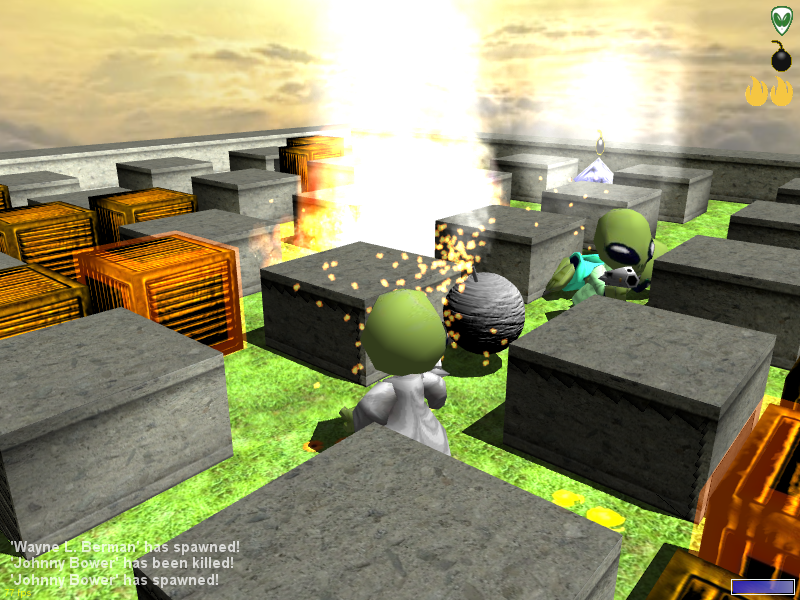 There’s also a change in gameplay: Robombs now supports a basic form of team play. You can join a team (1-4) by clicking on the “Team”-button. The server can always modify these settings by clicking directly into the players’ list on the team number before the name. In addition to all this, some smaller bugs in the gui has been fixed and the gui has been reorganized slightly. This version isn’t compatible with older versions of Robombs. Trying to connect to a 1.02 server with a 1.01 client will crash the client. Old news: (2009-06-15) – Updated the webstart and the zipped version with a new version of the 3D engine and LWJGL (the OpenGL binding). This hopefully enables Windows 64bit users to play the game when using a 64bit Java. (2009-01-31) – Robombs 1.01 has been released. It includes a better hardware detection for S3 and SIS-chipsets, three new maps (Prison Break, Bomba 09 and All For Free) and the fix of a bug introduced in 1.00 that caused the client to crash if the server disconnects. Again, you can’t use 1.01 together with older versions. Consider to upgrade all clients to 1.01. Have fun! 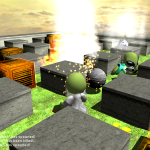 Robombs is a free Bomberman inspired multiplayer game in 3D. 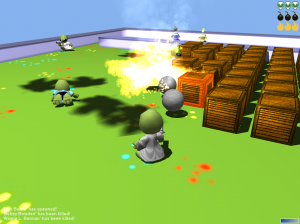 It takes the basic concept of Bomberman and transfers it into the 3rd dimension. It’s free, fun, easy to grasp and a nice addition to your next LAN-party. Albeit it has been designed as a multiplayer game, it also offers a basic singleplayer mode for you to have a little bombing fun even when none of your friends is available. It has been designed for LAN play. It may work over the internet too, but it hasn’t been optimized for this mode. The game comes with 9 levels (more to come in the future). All levels are roughly based on other games. 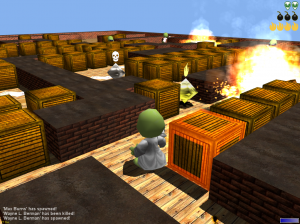 You’ll find a maze similar to Pac-Man’s, an Arkanoid inspired one, one that is based on a Call of Duty 4 level etc. Robombs is written in JAVA, which means that will run on Windows, Linux (x86), Mac OSX and Solaris. For more information about the game’s requirements, how to play and where to download, click on one of the categories above. It uses the jPCT 3D engine, which itself uses LWJGL for OpenGL support.